We house them in a mobile “Egg Mobile” that we can move around our pasture. 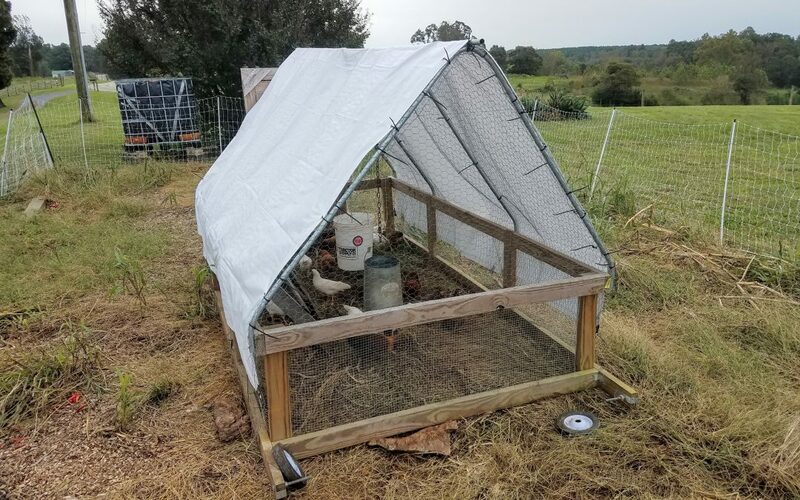 We did this initially because we didn’t want them scratching up any area as they will do if you leave them for too long and to make sure they had a good natural food supply in addition to non-GMO feed (modern breeds require supplementation to survive). We are now seeing the effects of super lush pastures, new grass varieties, and an accelerated growth that we haven’t seen in our other pastures. It’s well-documented that chicken poop is an amazing fertilizer, but wow. With this in mind, a fall project is to keep them in the garden for a couple weeks prior to covering the garden in mulch (leaves and wood chips). This will allow them to scratch up the garden, fertilize with their amazing manure, and then a composting process over the winter that will hopefully make for a super fertile Garden come next spring. We also plan to rotate them through our other pastures behind our grass-fed cattle to hopefully bring some of those amazing results to those pastures as well. It is our belief that working with nature benefits us all, and our amazing chickens are an example of this in action. Food For Thought – Is Grass-fed Beef Healthier?